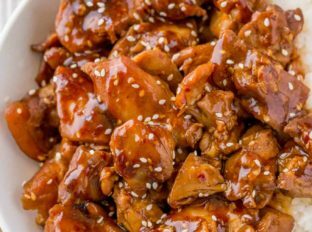 Skinny Sesame Chicken with a spicy and sweet thick glazed flavored with sesame oil is the perfect diet takeout copycat recipe! 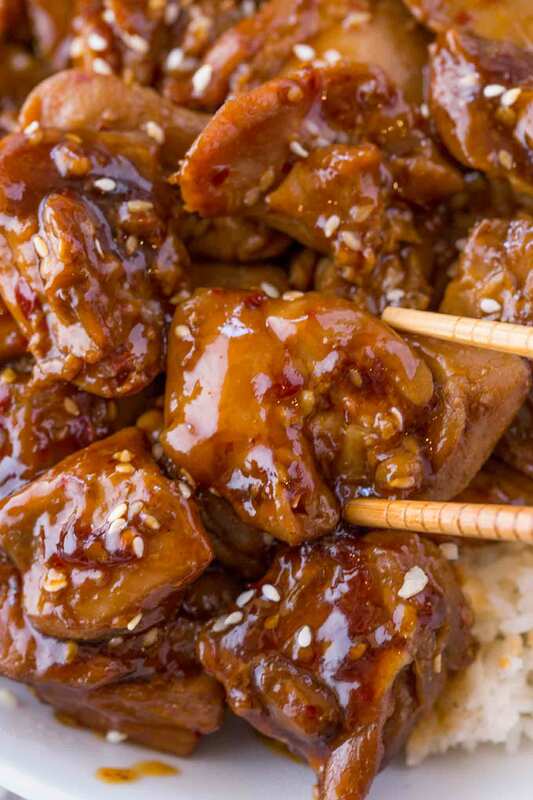 Sesame Chicken doesn’t need to be a dish you fondly remember anymore and you don’t have to start using any sugar substitutes to make it work. 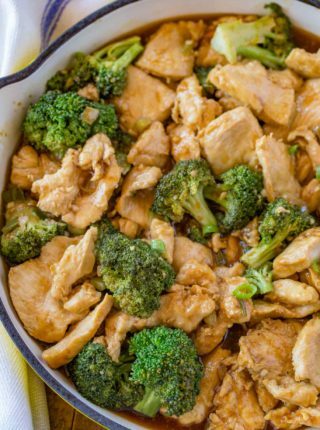 With a few easy swaps this Chinese Food Takeout favorite is much healthier! 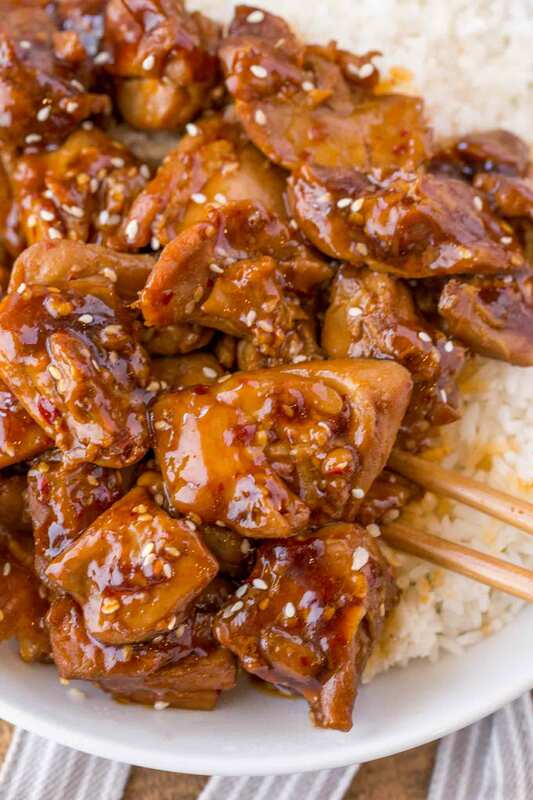 Typical Sesame Chicken is fried and crispy much like an orange chicken or a general tsao’s chicken. The versions I have on Dinner, then Dessert (my non diet focused recipe blog) are fried in a batter with a sticky and sweet glaze. In this recipe, we skip the batter, skip the deep frying and cut back on the honey. Most people who start a diet go in guns blazing, trying to minimize fats and calories. Once you find your stride in the plan you’ll see there isn’t really a way to feel satiated trying to game the system in the long term. You settle into using honey and oil again, you don’t worry about a tablespoon of cornstarch or sugar. 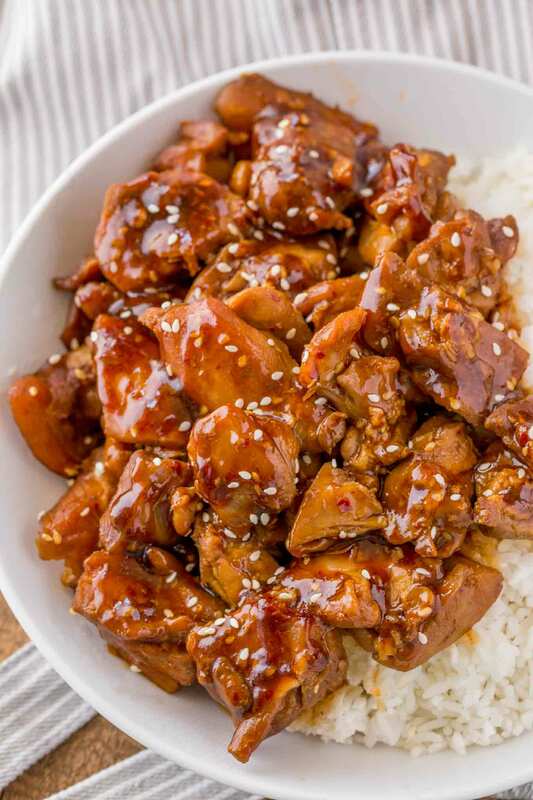 This recipe is not the lightest sesame chicken I could made, but it certainly is the most delicious updated version I tested. In fact if you’re open to a few more points, I suggest doubling the honey. 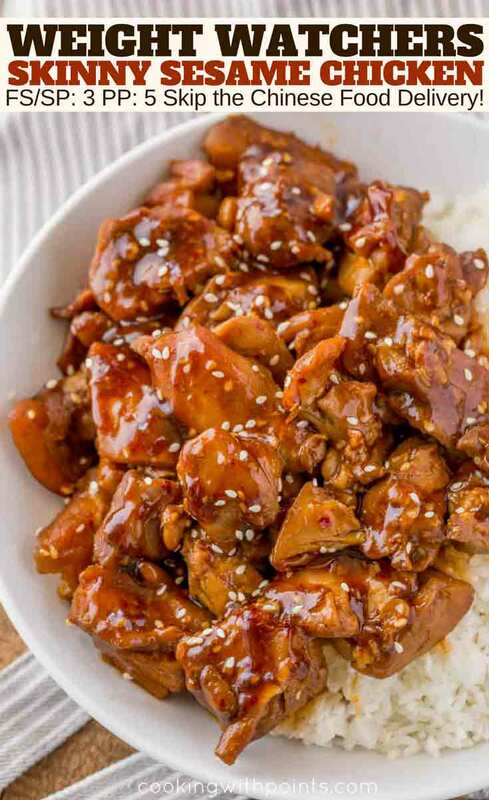 Sesame chicken is so sweet naturally it will taste more like the original. I didn’t include the extra honey because I don’t like that extra sweet flavor anymore since cutting out so much sugar. Cast Iron Skillet: This is my most used pan in my kitchen, heavy, keeps heat well and gives the BEST sear ever. Soy Sauce: Only ever use this brand, always in the lower sodium variety. Add the canola oil to a heavy skillet on high heat. Add the chicken and cook until browned and crisp. Remove the chicken, add in the sesame oil and heat. Add in the garlic, ginger and crushed red peppers and cook for 10-15 seconds. Add in the chicken broth, honey, soy sauce, rice vinegar and corn starch slurry. Cook until thickened and reduced before adding in the chicken and combining. All images and text © for Cooking Made Healthy. So glad I don’t have to miss out on this delicious meal anymore but continue to stay on track. Thank you!! 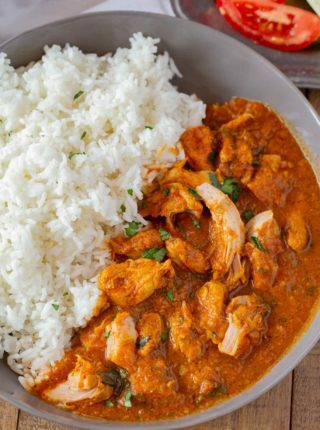 Such a great takeout style meal that is crave-worthy! 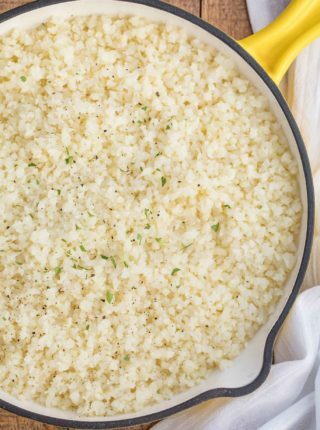 I love this healthier version of takeout favorite! I wouldn’t believe it either if I hadn’t made it! Love anything with skinny in the title. So sticky! This is my favorite dish! This is calling my name! Looks SO good! Are your recepies gluten free? I would love to make the Sesame Chicken, but not sure if I can. My recipes are not usually gluten free, but this one is easily adaptable to be gluten free if you replace the soy sauce with tamari. I made this and thought it was delicious and not hard to pull together. Thank you so much. I’m so glad you liked it! Thanks for coming back to let us know! Looks so good!!! How many cups or ounces(weight) is a serving? Roughly six ounces, depending how much the sauce cooks down. ok thanks so much! I really want to try this! This was delicious! I sauteed some broccoli after the chicken and served over cauliflower rice. My husband and son both loved it. So glad it was a hit with your family, Meegan! 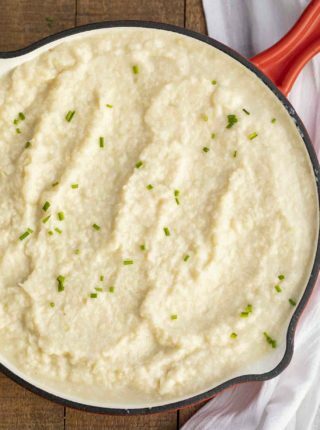 One of the best Weight Watcher friendly recipes I have tried in three months! The company that uses “points” has reached out to me claiming points are proprietary and demanded that I stop sharing them with my recipes. Sorry! I’m new to WW, how many points without the added honey? The company that uses “points” has reached out to me claiming points are proprietary and demanded that I stop sharing them with my recipes. You might have some luck using a recipe creator that calculates each ingredient individually. Sorry for the inconvenience! The company that uses “points” has reached out to me claiming points are proprietary and demanded that I stop sharing them with my recipes. Sorry for the inconvenience! Where is the point count, please? The company that uses “points” has reached out to me claiming points are proprietary and demanded that I stop sharing them with my recipes. Sign up for Daily Recipes straight to your inbox! Copyright © 2019 Cooking Made Healthy. Create a free account, save the recipes you like, and get daily recipes delivered straight to your inbox — plus receive a free e-cookbook!